The mandatory tele. Warmoth partscaster. Here’s my modded Cv Squier, the Cochranified Club and my battered old Mexican Tele. Is this honey too dark to be considered a blonde? There are some serious guitars in this thread. The Gibson Decades tour is stunning, Jim. Thanks Tim. Wish I could have kept 'em all (no chance of that). WHAT??? 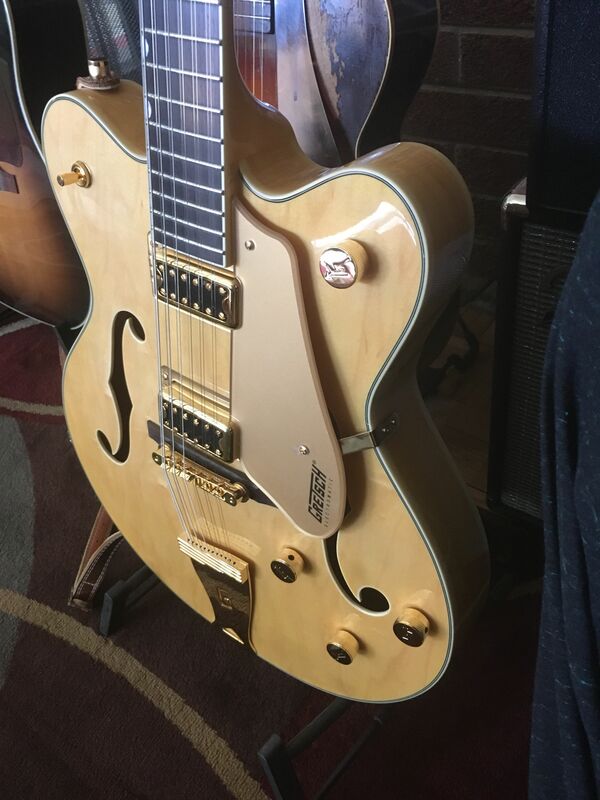 nobody around here has a vintage blonde ES-5 Switchmaster?? Gorgeous Jim!! Played one like that in the early '90's at the Carmel Music Company. Tiny little store but a veritable treasure trove of fine vintage instruments. BTW, folks it played like a dream!! I was there a couple of times, also in the early 90's. Great little shop, and such a relaxed atmosphere for trying out great guitars (although it's not where I got my D'A). I've always wanted to try a McCarty pickguard pickup, especially as Grant Green gets such beautiful and expressive tone out of them (mostly his phrasing) along with the p90s on his 330. Anyone ever played one? 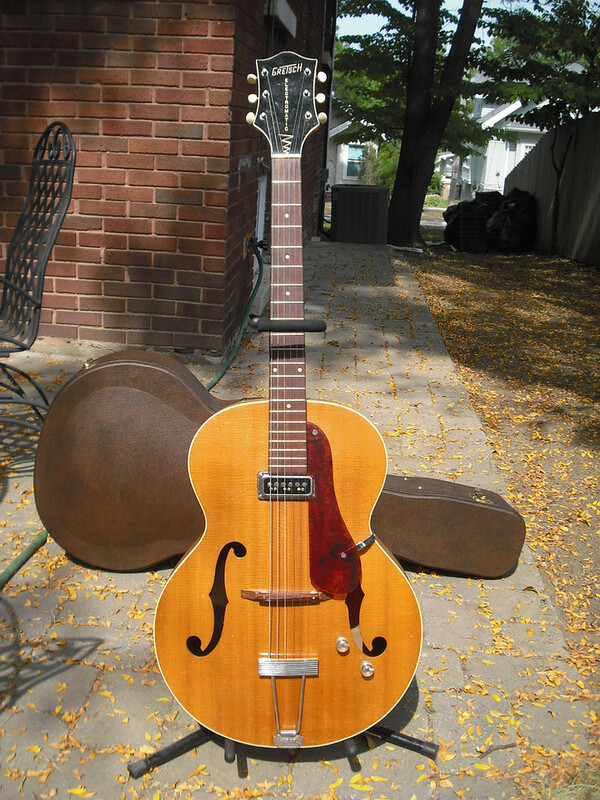 That and a vintage Charlie Christian are two pickups I would most like to get a chance to play and haven't. Thanks. I was very fortunate to have the chance to own some very nice guitars over the years. I was probably a bit crazy to have let some of them go, but I couldn't afford to keep more than a few at a time, and I was always restless and curious to try different things. Most of those opportunities came before prices went sky high. I was kind of disappointed with the sound of the McCarty on that Super 400. It's the only McCarty I ever played, though, so I can't condemn them based on that one experience. Vintage Charlie Christian pickups are just amazing. There's a bit of a trade-off between the heavenly tone and the noise/hum in some environments, but there's nothing quite like that sound. I hope you will eventually get a chance to play them! Got that (the guitar, not the radio) from George Gruhn in 1990. He said it had come to him from Harold Bradley. At the time, I didn't even know who Bradley was, but it was a great guitar. Love the amp. That particular edition is pretty scarce on this side of the pond (especially the side closer to the Pacific Pond). As always...I have that sofa......but not that guitar. One of the few times that a '66 makes me jealous over my '57. ...and this one just arrived.